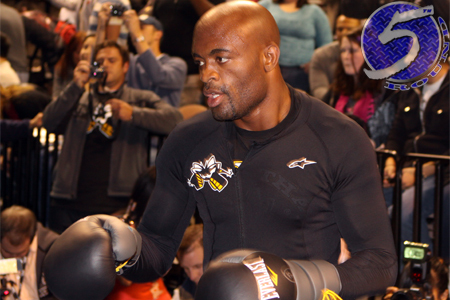 A “Believe Your Eyes” promo was launched before light heavyweight champ Jon Jones faced Rashad Evans at UFC 145, so it’s only fitting the organization released one for middleweight king Anderson Silva (Pictured) prior to his rematch with Chael Sonnen at UFC 148. The footage claims Silva is “The Greatest of All Time,” which I’m not about to argue with, and showcases plenty of his top Octagon moments. However, the video only runs 30 seconds so they couldn’t cram all of “The Spider’s” highlights into the shot. Unfortunately for Vitor Belfort, he makes a cameo in the clip for his face-to-foot defense at UFC 126. MGM Grand Garden Arena in Las Vegas, Nevada hosts the July 7th festivities.